It is August and plenty of my friends have mobile phone contracts up for renewal but want to wait for the new iPhone. In this situation, what they do has hand off to me their brand new iPhone 4S and I put it on eBay for them with the proceeds being put towards a new unlocked iPhone when they come out (so they can go between Canada and the US). This means there is an opportunity to do a little field experimentation. 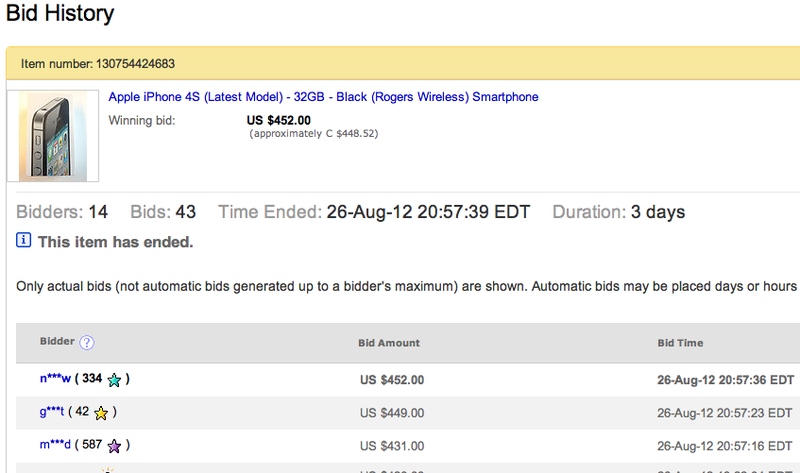 This week I took two iPhone 4S’s and put them on eBay at exactly the same time. The only difference in listings was that (i) the first auction offered free North American shipping while the second offered shipping at a flat rate of $30 and (ii) the second auction started and finished a minute later than the first (because I couldn’t launch them simultaneously — or, more to the point, couldn’t be bothered to work out how to do that). Now I should also add that I stuffed it up a little as the description in the second auction listed free shipping while the auction did not have that officially and so I had to do a little corrective work. However, that was days before the clsoing so I do not believe it distorted outcomes too much. Economic theory predicts that, with rational bidders, the prices for the two phones would be $30 apart. In the end, they were $26.97 apart which is not too far off if you are happy to think of 10% as not too far. But alas the experiment was actually a failure. If you look at the bids you will see that the auctions were each resolved in the last 15 seconds or so; a practice known as sniping that eBay has decided not to worry about. But what might not be clear is that the winner of both auctions was the same person. He sniped and won auction number one and then moved straight to auction number two. Perhaps he saw some convenience in dealing with one person. But I also suspect he was in the business of reselling iPhones overseas. What happened next was interesting. What I expected was to receive payment for the two phones plus $30 shipping for one of them. Instead, I just received the payment for the two phones. I asked the buyer if he had elected for local pickup as it turns out he was in Toronto. He had not. Instead, he figured that he did not have to pay the shipping fee because I could simply pop the second phone in with the first which had free shipping. My guess is that he had bid on that basis. From my perspective, with the free as with the flat $30 shipping, I had gambled and won on the shipping costs. It could have been a bidder in California which may have cost me $40 to ship but instead it was local. It still would be costly to UPS it as I had promised but likely less than $30. With a shout of “to the Coasemobile!” we had an exchange. I wrote: “I’m happy to accept half the shipping fee. Unless, of course, you’d prefer local pickup.”. He refused, writing back: “No bother then. Just ship the one 130754424683 that includes free shipping. And I will pick up the one 130754425183. Thanks.” Bravo, I thought. What an excellent ploy! He proposed to take the Coasemobile straight off the road while sticking to the letter of the property rights. Now a normal person might have just caved at that point. However, with the fact that I knew I wanted to write a blog post about all of this, I wanted to push on. In so doing, I did incur some risk to my otherwise stellar eBay reputation but sometimes you have to do what you have to do. While I deliberated another email came back: “Or I can pick up both and you give me a refund of $30 shipping for item 130754424683. Let me know which way you prefer.” Hmm, having gone off the road he now wanted to come back and take the entire bargaining surplus with him. There I had offered him a split arrangement and he wanted the $30; which was an arbitrary figure in the first place. I explained to him that he misunderstood what that fee was about and it had to do with the shipping auction and not the free shipping auction. With that he weakened, “O.K. I will pick up both and you refund the actual cost of Express services (UPS Expedited Canada) to me. Please let me know the amount.” That wasn’t a good option for me. I explained that I would have to go to UPS and weigh the phone and find out that price. But then I realised I had to up the game. Looking at eBays policies I think we have to keep to the letter of them because that is how they calculate their fees. So I guess we are forced to have you pick up one item while I ship the other. Just let me know when you would like to do that. I’ll take your Coasemobile off-road and just crash it with the force of eBay behind me. The one thing I could do is stick to the eBay contract. So I said that I would feel more comfortable if we pursued his crash plan. He agreed, “O.K. Then ship the one 130754424683 to me by Express services (UPS Expedited Canada) tomorrow. I will pick up the one 130754425183 on Tuesday evening.” It was late and I went to bed. I woke up in the morning with mixed feelings. To be sure, we reached an efficient solution whereby I had won the surplus contest, literally, in my sleep. But he had been so good at the brinkmanship game that his late night stumble disappointed me. I guess that, in the end, he had thought I was crazier than he was and, to be sure, I was going for that. I guess he was worried about his own eBay reputation although as a seller I can’t actually harm it. Anyhow, lest you think I am unreasonable, I wrote to him in the morning and accepted the $15 refund offer. That was my original Coasian split and, let’s face it, it wasn’t my money that I was dealing with. The moral of this story is that it is really hard to run field experiments. I wanted to control for the item, auction timing as well as the seller and their reputation but, in the end, that very effect polluted the result. To be sure, it was partially revealing as the second highest bids were $28.97 apart. I guess we can believe that economic theory pretty much works. As for bargaining theory, that is another matter. The market dynamics get interesting on eBay when there is a common item (iPhone in this case) with many sellers and many buyers. A buyer might bid on one item, and when his bid is bettered, make a bid on a different one. Although it was easy for eBay to do automatic bidding up to your maximum on a single item, it is another matter to say “I want one of these; every time my bid is exceeded, place an incrementally higher bid on whichever is currently cheapest”.